Teaching projects are not available for sale through local needlework shops. These projects are only available in a class situation. Please contact Debbie at debbie@DebBeesDesigns.com for information about classes. I also teach for Shining Needle Society’s cyber classes, so some of these projects may be available there. Ablaze is available in 3 color ways – Fire (at the top), Blue Blazes (middle), and Embers below). 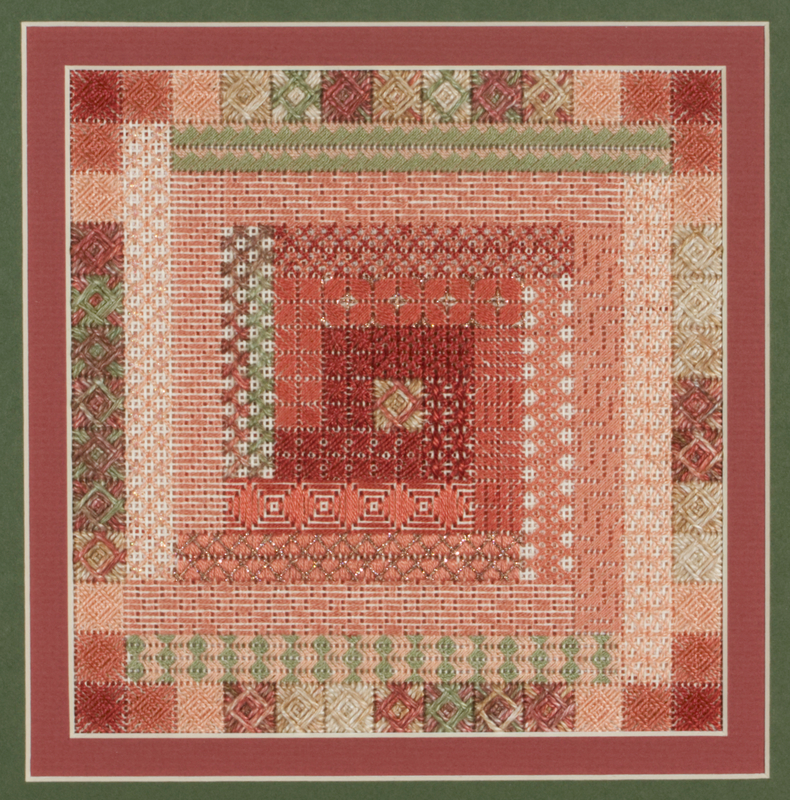 The pattern is a log cabin variation, with a striking corner motif featuring layered crescents, oval Rhodes, Bargello bands, diamond Rhodes, herringbone square and Maltese interlacing. 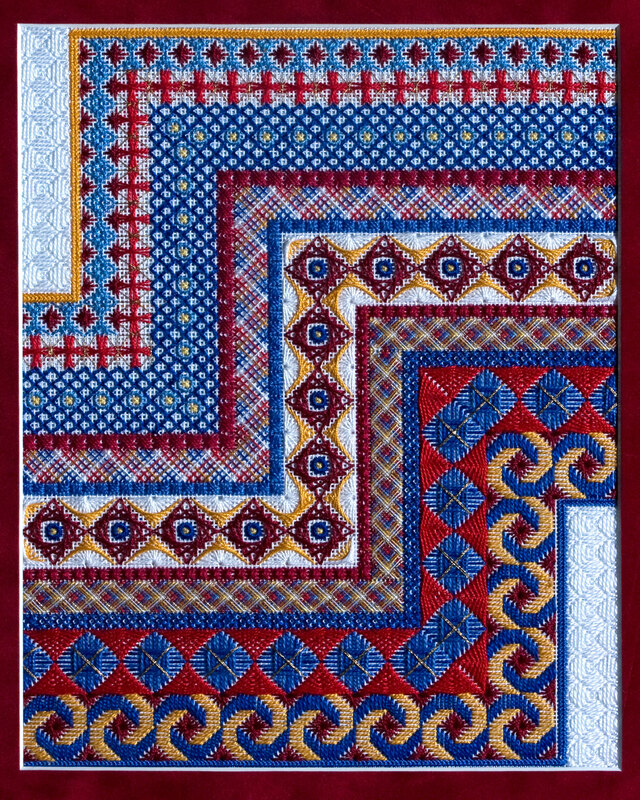 The band radiate out from the upper right corner, into Bargello swirls, waffles, medallion, layered cross stitch, sawtooth satin, oval Rhodes and 6 sided Jessicas, sprat’s heads, rays, and 8 trip herringbone. The project is a 2 day class, finished size about 8″ x 8″ on 18 ct. canvas. Adagio features a center motif with a Kitty’s double fan doubled, a Jean Hilton variation of the double fan doubled. Then I added sprat’s heads, Amadeus stitches, ombred Hungarian stitches, layered partial jessicas over ray stitches, oblong rice stitches, more Jessicas, waffle stitches, fans, and double herringbone stitches. I used Caron Collection Watercolours, DMC cotton floss and pearl cotton, Rainbow Gallery Neon Rays and Silk Lame’ Braids, and Kreinik #8 Braids. The project is 8″ x 8″ on 18 ct. sandstone canvas. Allegro will debut at ANG National Seminar 2019 in Houston, and won’t be available until after that. But it will be worth the wait! The center motif is a Kitty’s double fan doubled, surrounded by sprat’s heads, tear drop crescents and other fun stitches. Parallelogram Jessicas point to the center, with more Jessicas forming the diagonal bands. Rhodes stitches, hungarian and waffle stitches round out the design. I used several different cotton flosses and pearl cottons, with Caron Watercolours, Rainbow Gallery Silk Lame’ Braids and Neon Rays, and of course Kreinik #8 Braids. Design size is 8″ x 8″ on 18 ct. Sandstone canvas. 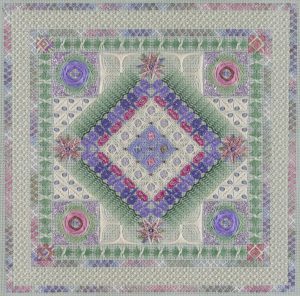 This intriguing project features loads of Jean Hilton stitches and other fun stitches in a grayscale color scheme, accented with a single color. Students may substitute out the red if desired; I’ll send a list of the threads used so they can bring them to class. This is a 3 or 4 day class. 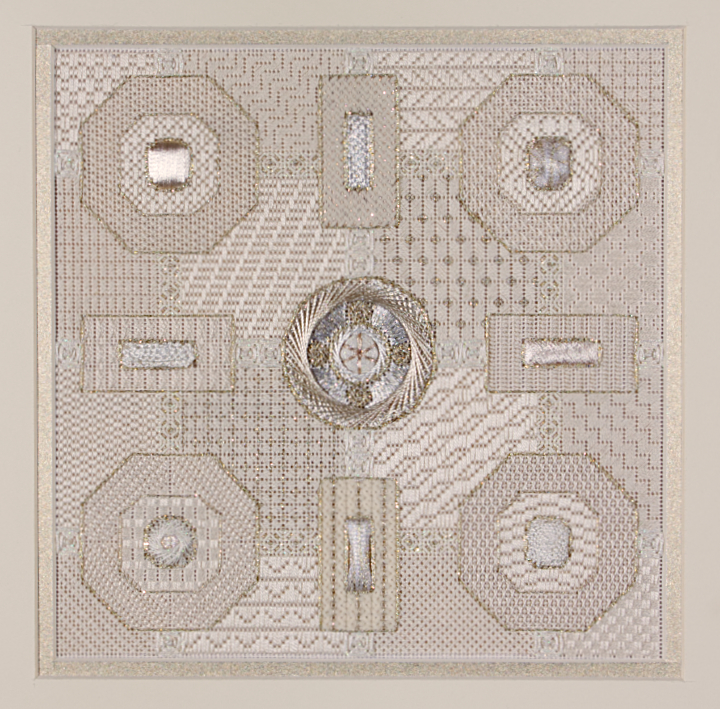 Design size – 181 x 180 stitches on 18 ct. pewter canvas, about 10″ x 10″. Kit includes 16″ x 16″ pewter canvas, DMC pearl cottons, cotton flosses and rayon flosses; Kreinik #4, #8 and #12 braids; Rainbow Gallery Silk Lame’ Braid and Neon Rays. Stitches include Sprat’s head, rice, Amadeus, Hungarian, laid stitches, scotch, crescents, Milanese, layered upright cross, Rhodes, upright point de tresse, long armed cross, diagonal fern, Bargello herringbone square, double fan doubled, eyelet, tear drop crescents, layered herringbone, upright waffle, Milanese pinwheel, several satin stitch patterns, 8 pointed star, double herringbone, Greek. A colorful design built in a log cabin quilt layout! This design features 8 canvas thread wide bands; the stitches used can be altered to different sizes for a different look. Design size – 104 x 104 stitches on 18 ct. white canvas, about 6″ x 6″. Kit includes Dinky Dyes, Kreinik #8 braid and Treenway silks in 4 weights for the Mardi Gras color way, or Caron Collection Watercolours, DMC cotton floss and pearl cotton, and Kreinik #8 Braids in the Coral color way. Stitches include waffle, Rhodes, rice Smyrna, bound cross, scotch, Brighton, cashmere, pavilion diamonds, herringbone, double herringbone, herringbone gone wrong, herringbone over satin stitches, Hungarian, double brick, Milanese, Parisian, trellis cross, point de tresse, Montenegrin and perspective. 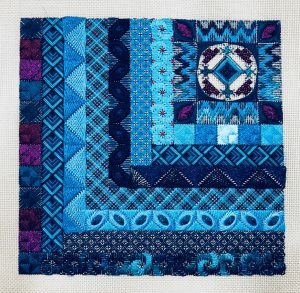 This is a good 1 day beginner class, although more advanced stitchers will find challenge in making changes to the stitches to personalize the design. I crammed as many circles as I could into this project! The class begins with the students painting their canvases. Then we start making circles – Jessicas, Rhodes stitches, spider webs, more Jessicas, detached buttonhole, and even more layered Jessicas. Along the way we stitch some satin stitch patterns – Milanese, Byzantine, and Scotch, Parisian, and brick. The final touches are 4 trip herringbone bands with an open background of couched lines over the painted canvas. Finished size is 10″ x 10″ on sandstone canvas. I used Caron Collection Watercolours, DMC floss and pearl cotton, and Kreinik #8 braids. Do you ever find it challenging to turn corners? This is the project for you! Cornered features several bands with instruction in turning outside and inside corners. I can teach it as a 1 day class, but it may be better as a 2 day class. Finished size is 8″ x 10″ on white 18 ct. canvas. I used all Presencia pearl cottons for this, in #5, #8, #12, and #16, with just a tiny bit of Presencia metallic floss for accents. 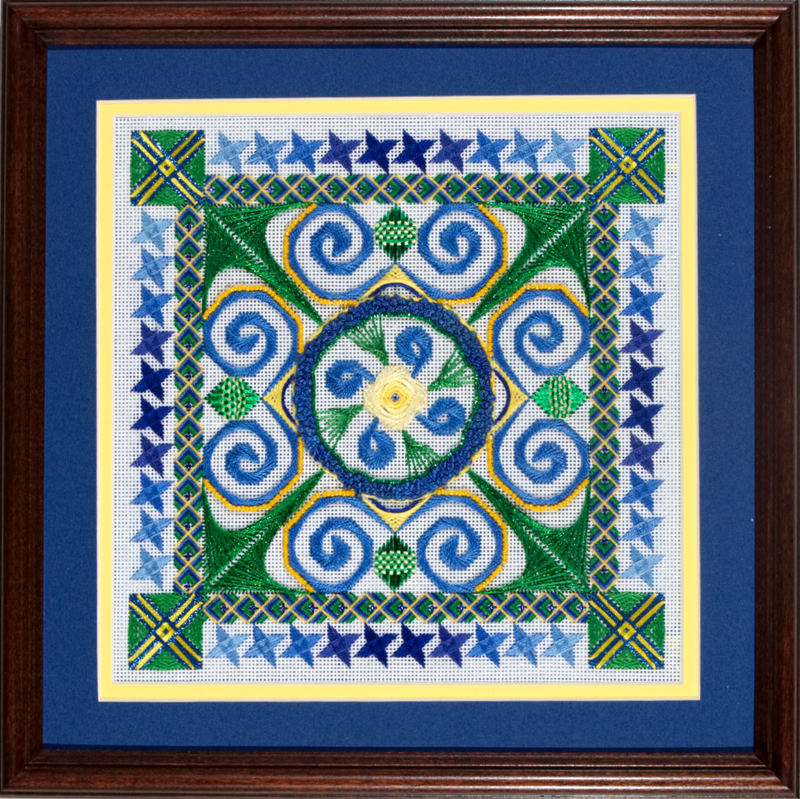 This project features several different Jessicas, crescents, eyelets, waffles, sprat’s heads, Bargello swirls, layered cross stitch, 6 trip herringbone, windmills, diagonal stitch, trellis, Rhodes, scotch, bound cross, and sutherland pattern. 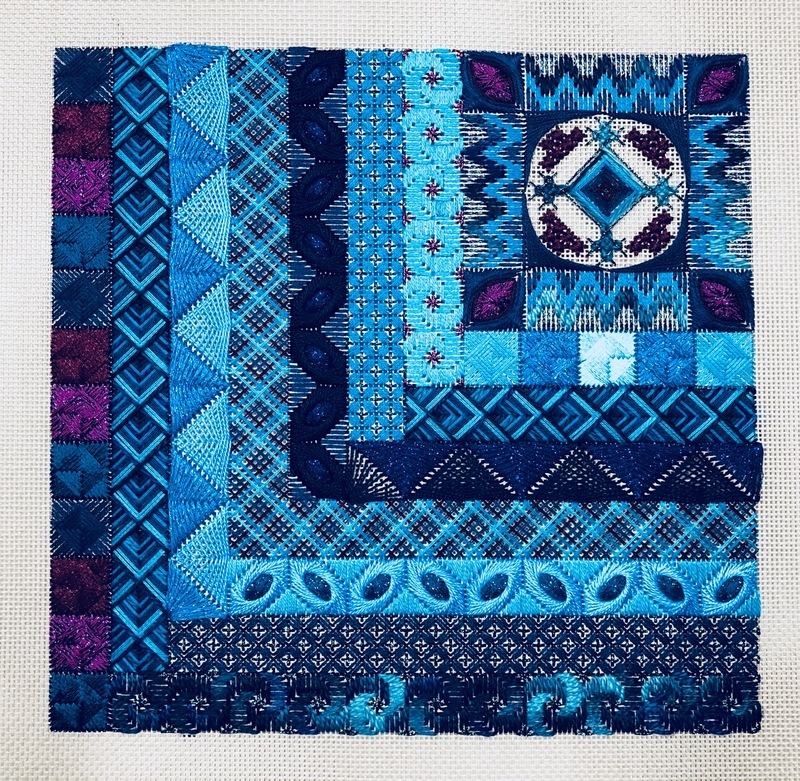 This project features large stitch motifs surrounded by four background and border stitches, lots to discover in 2 days! Design size is 144 x 144 on 18 ct. white canvas, about 8″ x 8″. 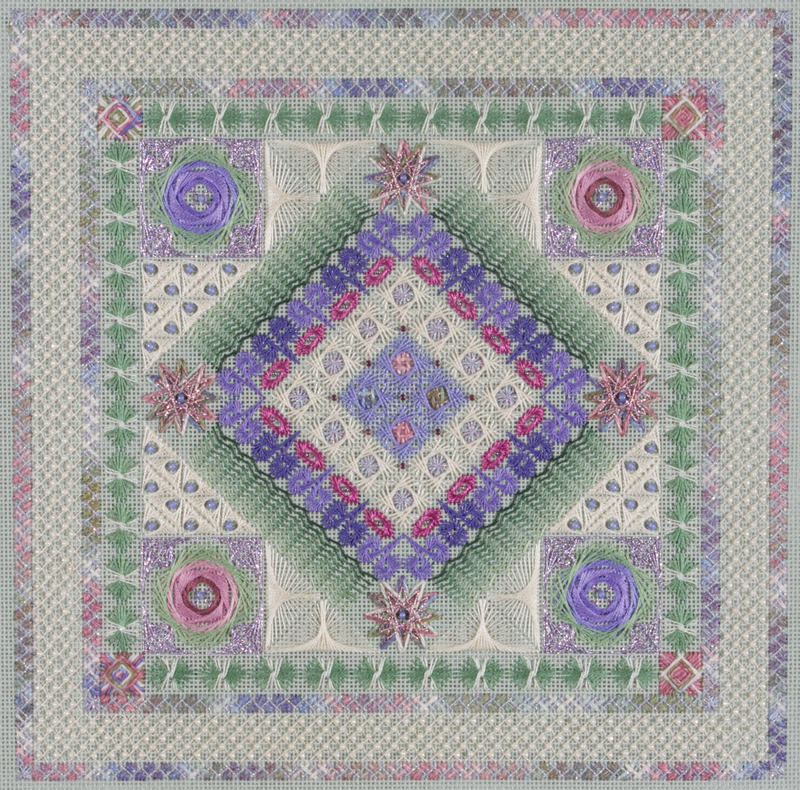 Stitches used include upright waffle, double fan doubled, herringbone square, Chilly Hollow, crescents, fans, Rhodes diamonds, 6 trip herringbone, layered cross stitch, perspective, point de tresse, criss cross Hungarian, diagonal mosaic, Brighton and scotch with gobelin. 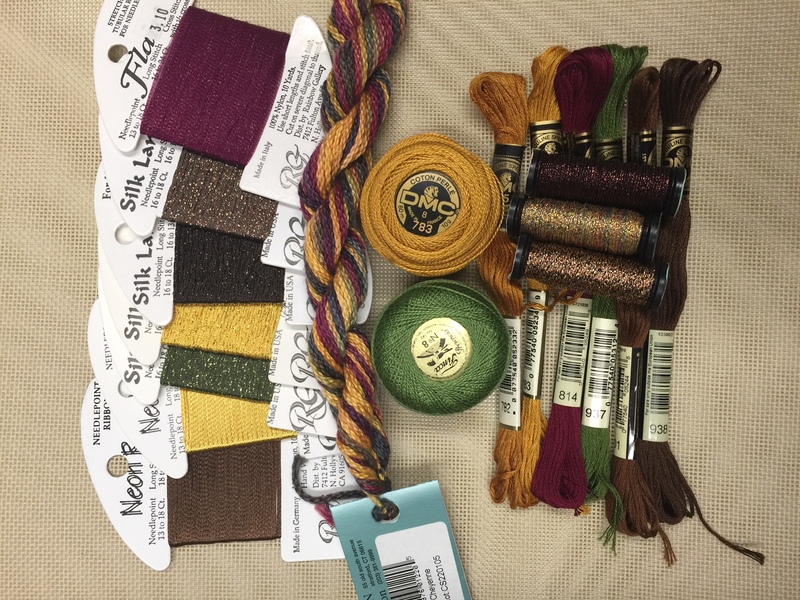 Thread kit includes DMC cotton pearls and cotton flosses; Kreinik #8 braids and Rainbow Gallery Silk Lame’ Braids. Perfect for advanced beginner to intermediate stitchers. Students are always surprised by how much is accomplished in the two day class. Available in 4 color ways: purple with yellow, blue with yellow, green with yellow and aqua with black. Prework recommended! Do you see the divisions in this project? The areas are not defined by borders, but by stitches and colors. Loads of Jean Hilton stitches in a four day project. 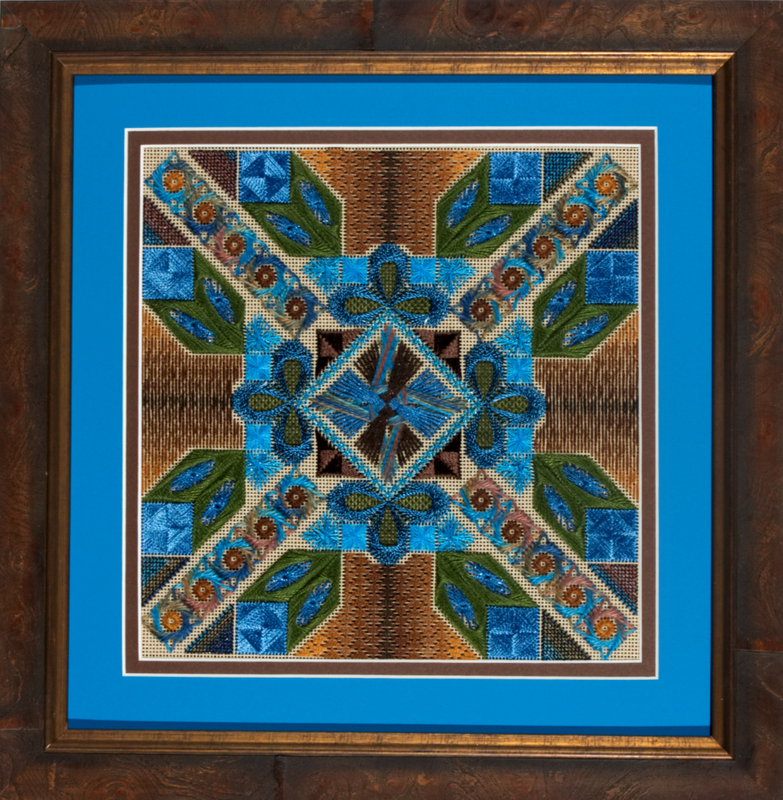 This is a largish project, 12″ x 12″ on 18 ct. canvas, 216 x 216 stitches. Stitches include waffle, double fan doubled, jessicas, walnetos, crescents, battlement couching, bound cross, reverse laced wheels, fancy cross, Amadeus, rays, Brighton, Victorian step, double leviathan, woven ribbons, sword Amadeus, trellis cross, scotch with overstitching, hungarian, sprat’s head, triangle Amadeus, Rhodes, 8 trip herringbone, bunger and laid patterns. 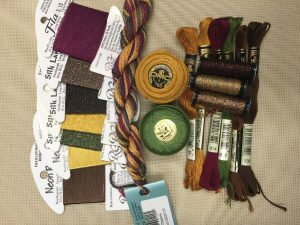 Threads include Treenway silks in four weights, pearl cottons, Rainbow Gallery Silk Lame’ Braids and Neon Rays, Kreinik metallics. Do you see how different it looks with the peacock colors! Let’s play with Jean Hilton stitches, color and texture! This fun design features double fan doubled, upright waffles and Chilly Hollow stitch, four background stitches and four border stitches. Design size is 6″ x 6″, about 104 x 104 stitches on 18 ct. canvas. Students may choose from pink, green or blue with ecru color schemes. Emphasis will be developing a natural stitching rhythm and getting out of the diagrams, to enjoy stitching more and overcoming common mistakes. Prework strongly recommended! Threads include DMC pearl cottons and cotton flosses, Rainbow Gallery Neon Rays and Silk Lame’ Braid, and Kreinik metallics. 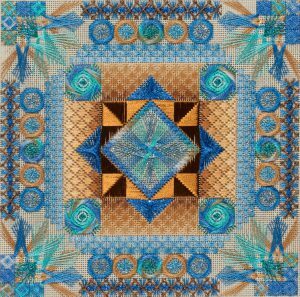 Explorations analyzes several kinds of stitches—large motifs such as walnetos, jessicas and crescents, background patterns and smaller spot motifs such as celestial star eyelets. 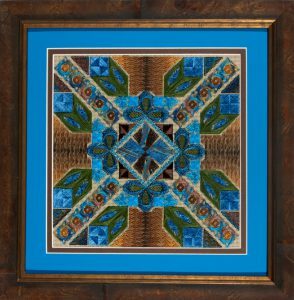 This project is available in three color ways: Jewel on antique blue canvas with ruby, sapphire, amethyst and emerald, Ecru on eggshell canvas with monochromatic beiges and gold, and Autumn on sandstone canvas with rust, copper and gold. I will emphasize the mechanics of each stitch, instructing in how the stitches are formed on the front and back of the canvas, so that stitchers can learn to stitch with fewer errors, faster and more naturally. Stitches include waffle, Jessica, Amadeus, herringbone leaves, walneto, crescents, celestial star eyelets, trellis, mosaic, pavilion diamonds, oriental, Milanese, criss cross hungarian, 6 trip herringbone, scotch, Greek. This is a very rushed 2 day class, a better 3 day class, or an optimum 4 day class. Design size is about 10″ x 10″, 180 x 180 stitches on 18 ct. canvas. Kit includes canvas, DMC #8 pearl cotton, DMC cotton floss, Kreinik #4 and #8 Braids, Rainbow Gallery Silk Lame’ Braids, Neon Rays and Panache. The ceiling at Union Station in Chicago was the inspiration for this project. Gilded Cabochons is 8″ x 8″, all ecru threads on eggshell 18 ct. canvas. This piece is loaded with about 40 different stitches, with special emphasis on the cabochons, padded or stuffed with felt or fiberfill. This is a four day class, could maybe squeeze it into 3 days, but it’s packed with tons of different stitches. I used DMC floss and pearl cottons, Kreinik #8 Braids, and Rainbow Gallery Silk Lame’ Braid, Petite Very Velvet, Petite Frosty Rays, Neon Rays, Neon Rays Plus, and Panache. 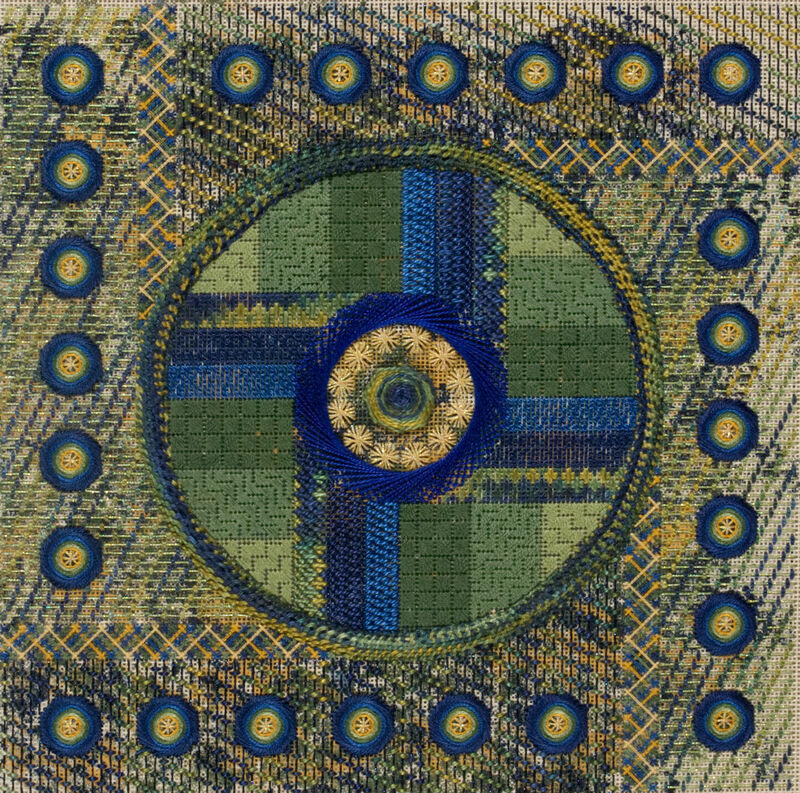 Rondo is a fun design in bright blues, greens and yellows. 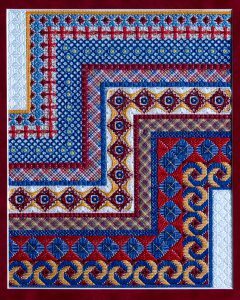 The crescents of various shapes and sizes provide a lot of movement to the design, with layered Jessicas, woven diamonds, waffle stars, Amadeus stitches, layered crescents and layered cross stitch. I used several cotton flosses and pearl cottons, Kreinik #8 Braids and Facets, Caron Collection Watercolours and lots of beads! Design size is about 8″ x 8″ on 18 ct. white mono canvas. 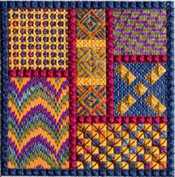 Shell Game 2 is a basic Bargello wave pattern punctuated with shell stitches and pearl beads. The center shell patterns are padded; students will have the option to pad the smaller stitches if desired. Design size is 8″ x 8″, 144 x 144 stitches on 18 ct. canvas. 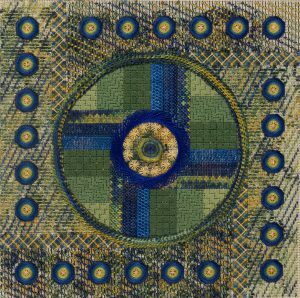 Threads used include DMC cotton flosses and pearl cotton, Watercolours, and 2 sizes of pearl beads. This is a good 1 day class for beginners to intermediate stitchers. I love playing with analogous color schemes, colors that are next to each other on the color wheel. Sonata employs two different analogous color schemes, cool (pictured here) and warm (red/orange/yellow). I’ve also devised a neutral color scheme as well for those who prefer monochromatic color schemes. 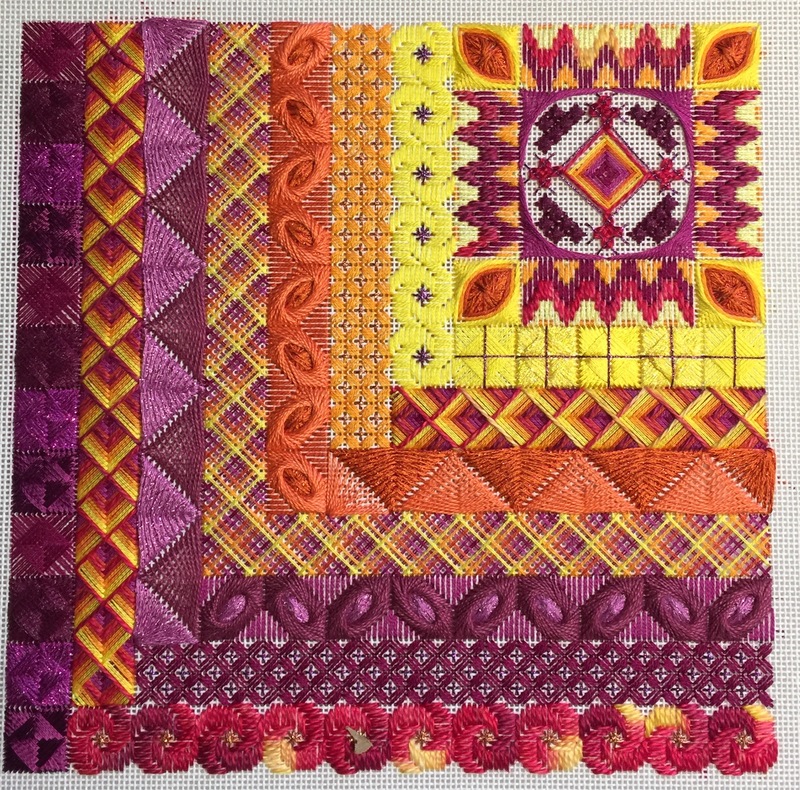 Lots of Jean Hilton stitches, playing with different textures, and lots of possibilities for playing with the color placement. 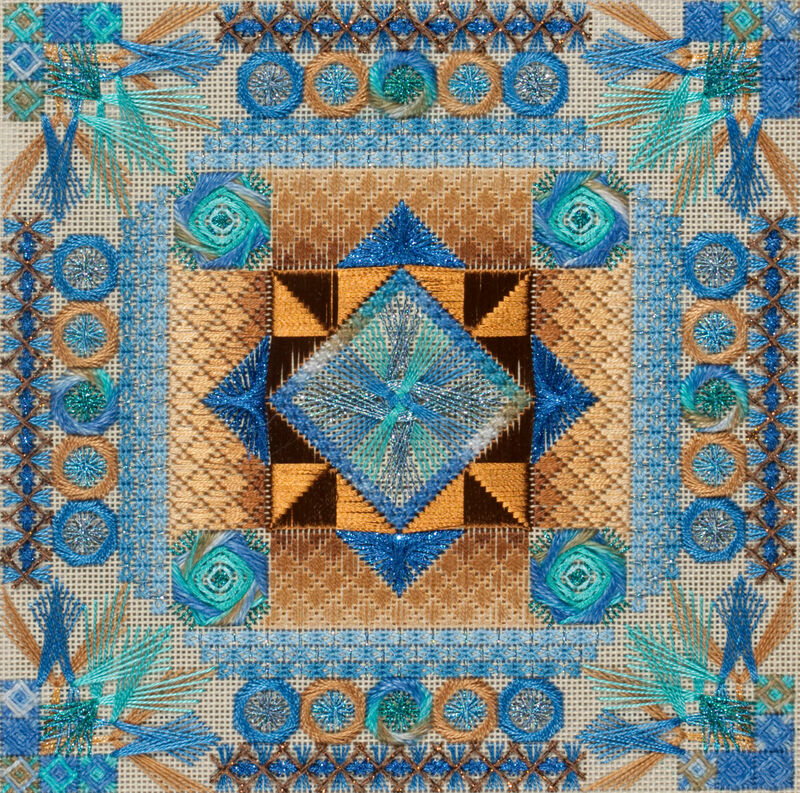 Sonata is 8″ x 8″ on 18 ct. canvas, 144 x 144 stitches. A symphony is a musical work in 3 or more movements, a fitting name for this colorful design. I was inspired by the shape of a color palette in pinks, purples and grays, and that inspired the divisions of the design and the colors. 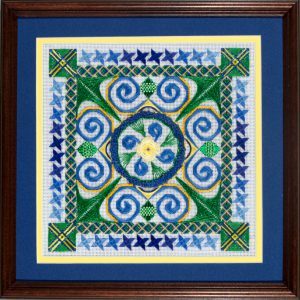 The design features crescents in several shapes and sizes, layered cross stitch, waffles, Bargello, Milanese pinwheels, double fan doubleds, Walnetos, and several back ground stitches. The model is stitched with DMC cotton flosses, Satin Floss and pearl cottons, Kreinik #8 Braids, Rainbow Gallery Silk Lame’ Braid, Flair and Neon Rays, Caron Collection Watercolours. Stitches include brick, waffle, Jessicas, teardrop crescents, sprat’s heads, walnetos, wheat, woven, layered cross stitch, rice, sword Amadeus, windmills, woven ribbons, 8 pointed star, Rhodes, Victorian step, floral cross, Greek, trame’, Byzantine, Milanese pinwheels, Milanese, double fan doubled. Design size is 180 x 180 stitches, about 10″ square on 18 ct. white canvas. A four day class. I picked out some of my favorite Jean Hilton stitches, and designed a project with them. The center is filled with walnetos, Rhodes stitches and waffle stitches. Then it expands into crescents, 12 pointed stars, Amadeus, crescents and layered partial Jessicas, with a border of Val’s stitches, waffles and double herringbone. I finished it off with beaded trellis stitches, giving it a lacy look and feel. I used Caron Collection Watercolours, DMC cotton flosses and pearl cottons, Kreinik #8 Braids, and Mill Hill glass seed beads. The finished size is 10″ x 10″ on 18 ct. sage canvas. Cindi, I do offer classes with Shining Needle Society, and have done a class for ANG Cyberpointers as well. So even though a class isn’t available in your area, you could participate in a cyber class. I prepare stitch video demonstrations for my cyber classes to help students every way I can, just as if we were in a class together. I’m getting ready to add a calendar to my Classes page so you can see when and where I’ll be teaching a class, and hopefully you’ll be able to join in, either on line or in person. Hi Debbie, This is the old name I used on YUKU groups before Face Book became THE thing. I am also Karen Magallon on Face Book. I am constantly leaving comments about your patterns on a FB page. I think it is Counted Canvas on Mesh? I will have to check that name. I also wrote to you ….some where…. when you posted your Sheltie had passed away. I had just lost my sweet Beagle so it must be about 2 years ago. I got a dog that is half Bichon and half Shitzu a little too soon after my Beagle ( her name is Doggie ) passed. I missed having her near me for 9 years that I bought this other sweet soul on a whim. I had urged you to just go ahead and get another Sheltie. Anyway, I am so interested in taking some of your classes. You mention you may teach in the Great Lakes area. I live in a SW suburb of Chicago. Even though Chicago is a huge city, the LNS are few and far between . The closest actual needlepoint store in Westmont or Western Springs just closed their doors in February after 20 years. There is a counted cross stitch in Orland Park , Illinois , called Country Cupboard is THE only needle craft place around me. I don’t know if you have ever taught there. I am semi disabled but I can try and go anywhere or even Ghost . I Ghosted a class in October called ” At the Water’s Edge” so I know how to do it. I like Angles, Criss Cross, Explorations, and Shell Game. Especially the way someone on the FB page just posted theirs with an sea green / aqua color! I know that one would be fairly easy for me but, as you can tell from my screen name of Chicago Mermaid, it is right up my alley. Let me know? By the way, I will be married 47 years in June. When I read some of your blogs, I am amazed at some of our similarities . 🙂 Thank you. Oh…I have to post my Twinkling Gems I just got framed. I love your patterns! The more Bling the Better! I am foaming from the mouth over Citron! Karen, Explorations and Shell Game 2 are about to taught through Shining Needle Society, so watch for announcements when registration will open. I’m also teaching Explorations for Great Lakes Region Seminar in April, and although I’ve asked several times if they will allow ghosts I’ve never gotten a response to that question. I think registration has closed for that class. Angles will be taught for American Needlepoint Guild National Seminar in August in New Orleans, but I don’t think they will allow ghosts. After seminar I’ll be looking for places to teach Angles, possibly with Shining Needle Society, but that will have to wait until after seminar (contractually obligated to not teach it until after seminar). Criss Cross isn’t currently on any schedule, but I’m sure that will change. I’m about to put a calendar on my website with when and where I’ll be teaching. Thanks! I like the teaching piece Angles very much. Where can a class be found? I am in SE MI. 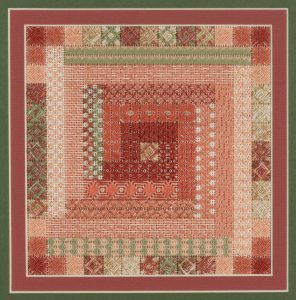 Right now the only place on the schedule for Angles is American Needlepoint Guild National Seminar, this August in New Orleans. That will change after seminar (I’m contractually obligated to not teach this piece until after seminar). I’ll try to keep where and when I’ll be teaching this piece on the website. Thanks! Hi! What is the name of the project or completed canvas for the designs featured on the YouTube videos at the moment? You reference “the book” several times. How/where do I get it? A lot of the videos are for Criss Cross, a project available for sale retail. If you need to find a retailer to help you with this let me know! I purchased Tahiti Triangles several years ago, along with appropriate materials. I’d love to get it done. One thing…the 18 ct is just too tiny for me. Also the black canvas doesn’t help. Any suggestions? Do you think if I used 16 ct and a lighter color canvas I might be able to make this work? Perhaps bumping up the # of strands as well??? 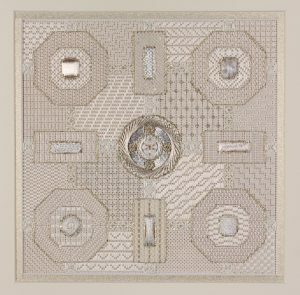 I think the project can certainly be done on a lower count canvas, because the threads used are adaptable to a variety of ground materials. You may need to increase the number of strands for the cotton floss and silk floss (Waterlilies), but I think the #5 pearl cotton and Watercolours should be fine. Unless you go to a 13 ct., and for better coverage you may need #3 pearl cotton. I’ve seen this project done on higher count (24 ct. Congress cloth) and it turns out fine. Also, if you don’t want to stitch on black canvas don’t! Just about any color of canvas will work because of the many colors in the project. You may be happiest with sandstone or eggshell rather than a blue or green, but I think you’ll still be pleased with the finished look. You may be fine with 18 ct. lighter colored canvas, but if not try a lower count!